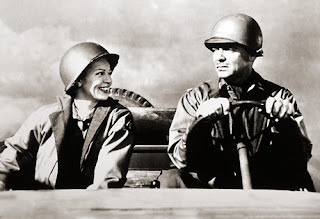 My choice this week is HOMECOMING, a romantic drama told in flashbacks that shift from home-front to WWII battlefield operations. A film very well directed by Mervyn LeRoy. HOMECOMING contains one of my favorite Lana Turner performances. 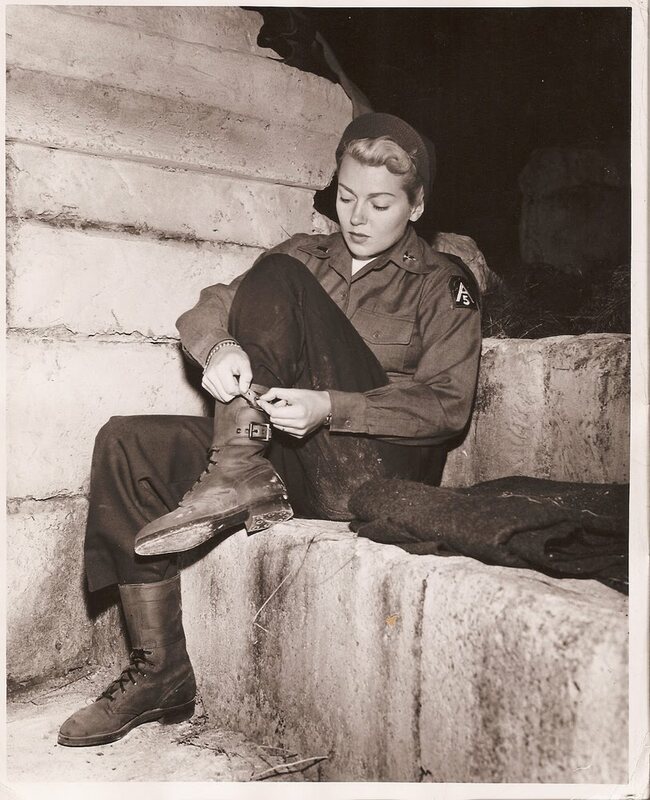 She is Lt. Jane 'Snapshot' McCall, an Army nurse, played as close to natural as Lana was probably capable of. She is actually likable in this film, her character is someone you'd want to know, someone not trapped in the clutches of a heinous blackmailer or plotting to kill her husband or tearing her hair out over her daughter's peccadilloes. In other words, a 'regular' person. Well, as 'regular' as someone who looks like Lana Turner can be. She is really quite wonderful. In Army fatigues and combat boots, her dazzling blond hair covered with a cap or helmet, Lana is as de-glamorized as a beautiful woman can be. The appearance of her character is a million miles away from the bored femme fatale draped in white in THE POSTMAN ALWAYS RINGS TWICE. Clark Gable is no slouch either. This is one of my favorite of his many wonderful performances. He plays Col. Ulysses 'Lee' Johnson, a self-absorbed, over confident surgeon who joins the Army for no other reason than it's expected - not a doctor with an overly caring bedside manner. As the story progresses, his cynicism and steely composure are shaken as he finds himself grimly doing his best to save lives on the WWII front. 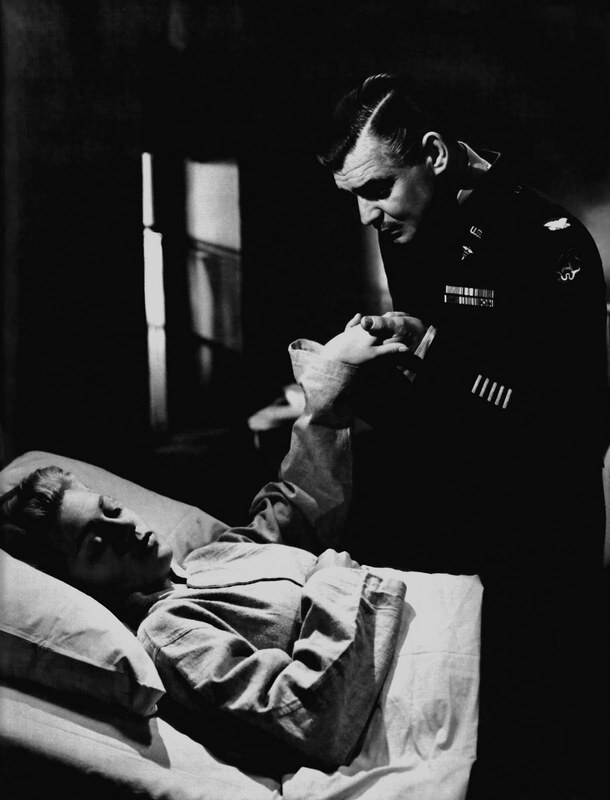 On a transport ship, he meets nurse Jane 'Snapshot' McCall. The do not immediately hit it off. She is everything he is not; caring, easy-to-like and devoted to her work. She is someone who will not put up with Lee's stiff-necked nonsense, even if he does outrank her. At first Lee doesn't know what to make of her, she is so obviously very different from the women at home. As the war progresses, Lee has his eyes opened by the devastating injuries he and his staff confront on a daily basis. He is grudgingly won over by Snapshot's gumption and selfless concern for her patients. 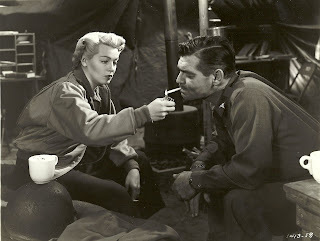 They grow closer while he dutifully writes to his wife Penny (played by Anne Baxter) back home about his new found friend's expert nursing skills. 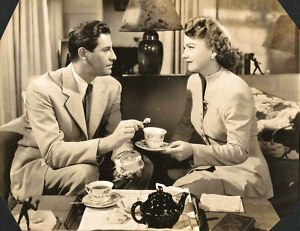 When his letters contain one too many references to Snapshot (whom his wife at first took for a male colleague) she begins to suspect that Lee may be having an affair. Her confidant is Dr. Robert Sunday (John Hodiak who was Baxter's real life husband at the time), a colleague of Lee's who'd locked horns with him over his methods, more than once. There is no affair at the moment, but Lee is slowly getting emotionally entangled with Snapshot - their war experiences drawing them together as Lee also comes to realize what a self-centered failure he'd been in civilian life. And how his impervious-to-criticism medical methods might have actually harmed patients. Gable and Turner taking direction. 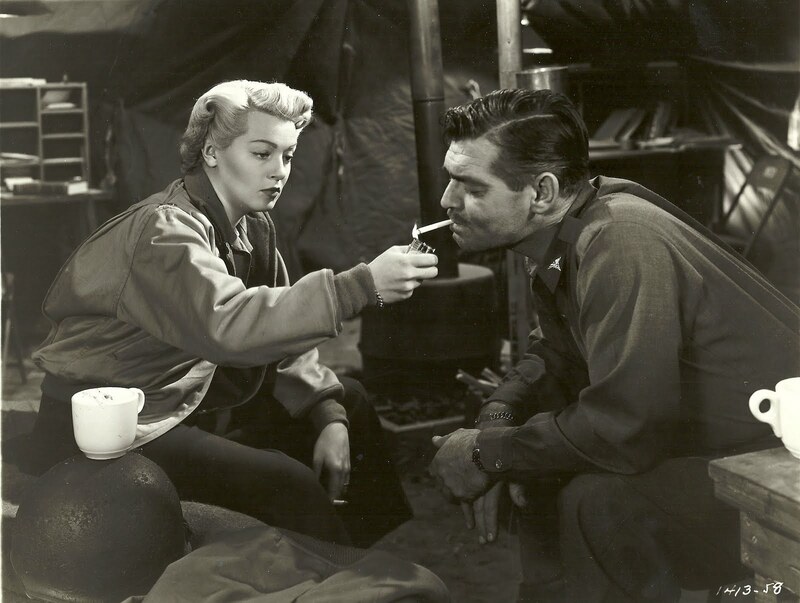 Gable is very good in these developing scenes as Lee begins to change and grow as a human being. Then we see the guilt he feels as he realizes he's fallen in love with Snapshot and she with him. In juxtaposition, the differences between women serving at the front and women back home is made apparent. The basic surface differences - at least - between the scruffy, ready for anything Snapshot and the manicured and patient Penny who can do nothing but wait at home are obvious. It's a lop-sided imbalance of course, because it's to be expected that being a doctor or nurse on the battlefront can't help but change a person. These are experiences that Penny will never really know anything about. In that she is at a major disadvantage. When Snapshot is gravely wounded at Anzio, Lee must suffer through it alone. He returns home a broken man in need of understanding and comfort. In these last moments, Gable manages to look so deeply wounded in heart and spirit that he takes your breath away. It makes for a very powerful scene. Over the years I've watched this movie several times and it never fails to move me. 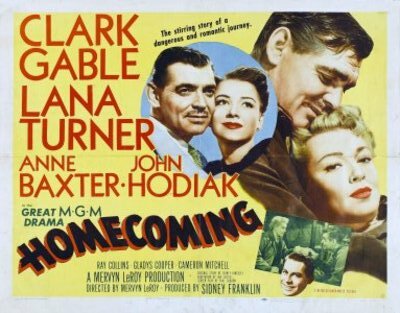 If you haven't seen HOMECOMING, I recommend it as one of Gable and Turner's better pairings. This is by far the best of the HOMECOMING posters showing the two leads as they actually appear in the film. Visiting your blog quite for a while and love it! So many of 'my' films and books. Although I'm German, most of them are translated or adapted in German language. 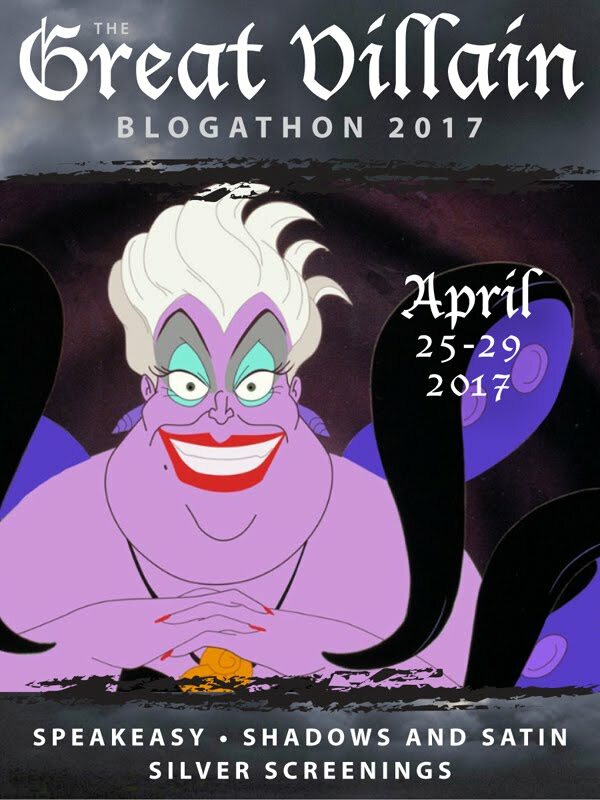 Well - your blog - in a word: simply good and unique! All in English although my English is not good at all and I'm miles away from being a decent writer. I can't believe I never saw this, but I have no memory of it at all. Such a Clark Gable fan. Karin: Thank you so much! I'm glad you've been enjoying my blog. The Perigord, a beautiful area of the world. I will definitely check our your post. Patti: Oh, then you must see this film. You will love it. I love Lana Turner but I don't think I've ever seen this movie! I must rent it! I adore both Gable and Turner so I may have to watch this one. Agree with LaPouyette. IN SO MANY WORDS... is a very fine blog, indeed. I can relate to nearly everything you write about — even if it's books and movies I haven't read or seen yet. Ryan: Oh you definitely should see this one, for sure. As I told Pat -Don't miss it! I haven't seen MANHATTAN MELODRAMA in years and years. I'd quite forgotten it. 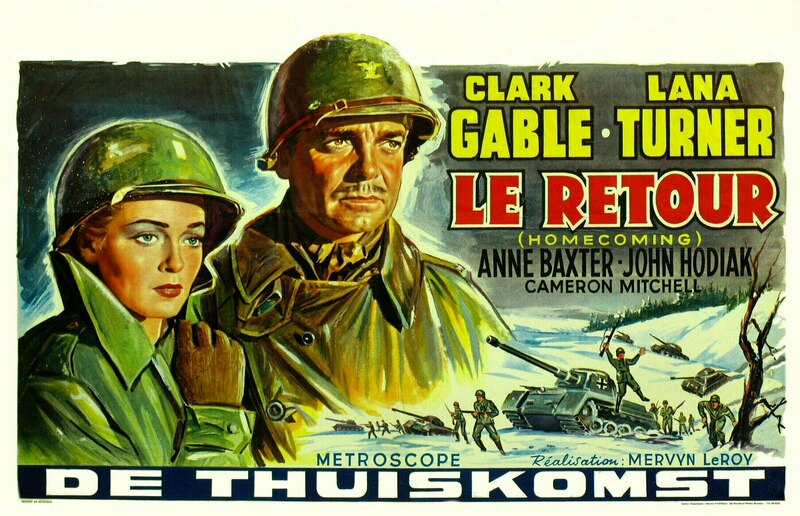 I haven't heard of or seen this film, and I'm generally not a fan of war movies -- but, with Clark Gable -- and Lana Turner in the mix, who can turn this down? It's now on my TBS (To Be Seen) list, which is now competing with my TBR list. 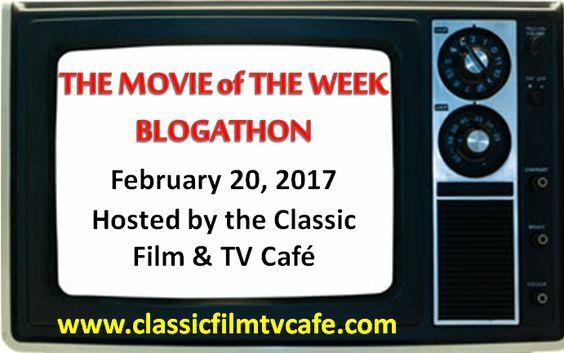 And thanks to the blogger who mentioned Manhattan Melodrama. With those three in it, how could I resist? Kathy: If you can find this, watchi it! It's really quite wonderful. 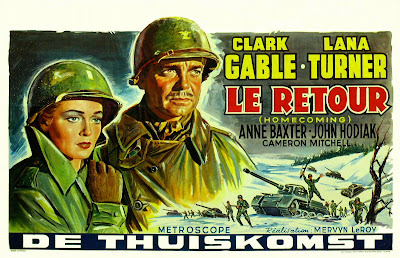 One of my favorite Gable films. Yvette, I just got an opportunity to sit down and read your excellent HOMECOMING blog post. Having had relatives who served in both World Wars, I was moved by your review, and impressed to read that Lana Turner showed her scrappy side. But why was her character nicknamed "Snapshot"? Was she a photographer, or perhaps a former pin-up queen? :-) Either way, HOMECOMING sounds like a winner! I don't usually seek out war movies, but you've convinced me to keep an eye out for this one. Yes, Lana did play a nurse who used a camera - why she's called Snapshot. But I didn't include it in the review because I wasn't sure if my memory served me correctly. Yvette, I think this is an excellent review of a World War II movie that sounds so good, and yet I have not seen it. Perhaps it is not shown very often, or I just missed it. The whole cast is comprised of favorite actors and actresses, with Turner and Gable each playing parts a bit different for them. I would like to see Turner, at the height of her beauty, playing a nurse without glamour. 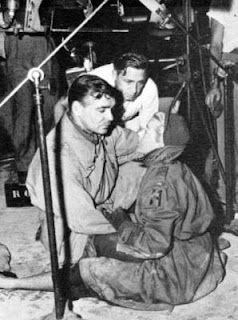 I'd like to see Gable playing a man without much character who painfully finds it through his experiences with war and difficulty in love. 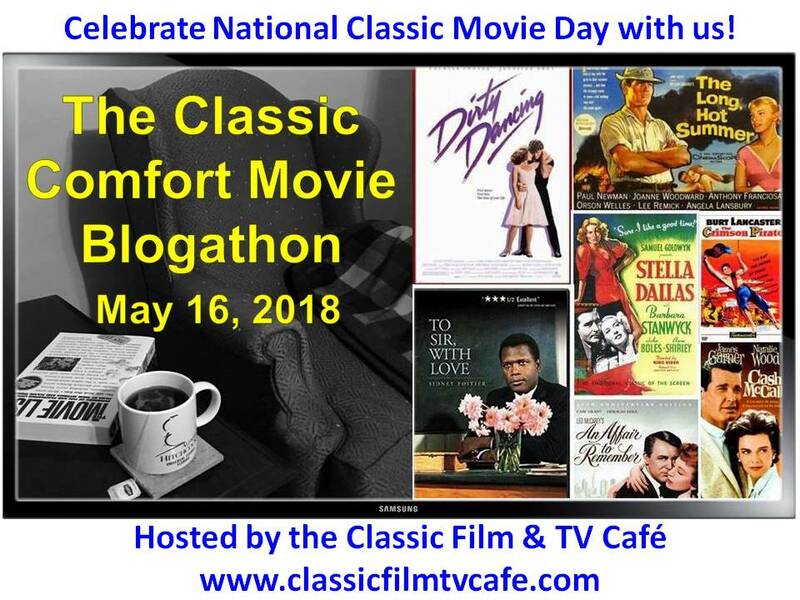 Your good description of the movie almost reminds me a little of Dr. Zhivago - the husband a war as a doctor, falling in love with the nurse he works with, the wife at home whom he also loves. Interesting similarity. Do you know why I say your description of the movie itself is good? Two reasons: (1)You make me want to see it right away; and (2)You told just enough but not too much about the outcome of the story. I mean, I can guess all I want, but I don't really know exactly what takes place! That's good movie writing! Oh thank you for all the kind words, Becky. I'm so pleased you enjoyed the review, especially since you haven't seen the film yet. But I urge you to try and find a copy. It really is worth the trouble. That is an interesting point you made about Dr. Zhivago. Hadn't thought of it at all.